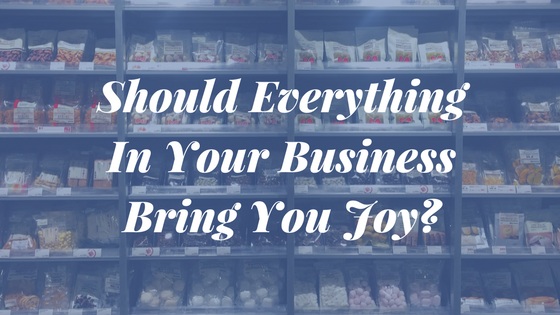 Should Everything In Your Business Bring You Joy? You went into your business because you wanted to be fulfilled in what you do day in and day out - but does every aspect of your business make you happy? Should it make you happy? The craze of "only keeping things that spark joy" in your life is a fantastic idea - it has helped thousands (maybe even millions) of people to clear things out of their life that are holding them back and even out of jobs that make them miserable (that's exactly what Jenna Kutcher did, and it was pre-The Life-Changing Magic of Tidying Up). But, do we really need to clear everything out of our business that doesn't 'spark joy'? Should You Be Happy in Your Business? Yes! If you're working 40 hours a week, that ends up being 45% a year of your waking life (using an 8-hour sleep cycle as a base). If you shouldn't be happy that much of the year...I think we're all doing something wrong as a society. Have you ever thought: "When I have money, I'll be happy." Why should you have to wait? With that mindset, even when you reach that goal (whatever that monetary end goal may be), it won't be enough. If you're not enough to be happy now, why will having money change that mindset? Your business and your income are not your life, they work to enhance your life. If you are continually unhappy with your business, that attitude will seep over to your personal life. Instead of making business (and money) the source of your happiness, you need to allow yourself the freedom to enjoy your life and your business now. As your joy grows, your business will grow and the money will grow, too. What Brings You Joy in Your Business? What we focus on in our life, makes up our life. You know that person in your life that always seems to be happy no matter what is going on? To you, they are an equal mix of annoying (because their life seems perfect, how else could they always be happy?) and refreshing because they can always bring a smile to your face. But they don't have a perfect life and everything doesn't always come easy, but they do have an outlook on life where they focus on the positive, the joy their life brings them. If you make the choice to focus on what is fulfilling, interesting, and fun in your business (and life), then you are choosing to set your sights on a business full of joy and life. Let's figure out what it is in your life that makes you happy, what specifically about your business brings you joy? Do you love connecting with your audience and helping them grow? Do you love coming up with new marketing strategies to grow your business even bigger? Do you love one-on-one conversations? Take a moment and write it out. It may be one thing, it may be a list of them, you just want to focus on what it is for you! What Do You Dread in Your Business? Not everything is unicorns and cupcakes in business, there are going to be pieces that confuse you and frustrate you and feel like they are unnecessary because they don't make you feel happy, but, instead, inadequate. What do you find yourself putting off, day after day? What leaves you fighting back tears or threatening to throw your computer out the window? What makes you feel flustered? Running a business should mainly be something you enjoy - otherwise, why are you spending so much of your time doing it? But, as you know, it can't always be a joyful matter - so let's change that. 1. Drop the unnecessary things. There are a few things that you are doing that you probably don't need to be spending your time on. Maybe you're constantly looking at what your competitors are doing and always trying to mimic it. Maybe you're always jumping on the latest craze and feel bogged down in trying to keep up. List out all the activities you're doing (that you enjoy and don't) and cross out the things that aren't directly bringing in new business for you or keeping your business running. Don't try cramming all the things you don't like into one day and crossing your fingers that you'll magically want to get it all done, instead sandwich the unpleasant but necessary items between the things you love! You know how as a kid you always got a lollipop after you got a shot? The shot was necessary and the lollipop was the perk - what in your business can be a perk after a shot? 3. Stop striving for perfection. Sounds crazy, I know, but the saying "done is better than perfect" is said for a reason. What holds you back because it's not perfect? You’ll never be able to expand your success if you don’t give yourself permission to make a few slip-ups. Successful people don't see failures or mistakes as an end, but as a learning experience to grow from and you should, too. 4. End speaking to yourself negatively. Studies show we say 300-1,000 words to ourselves every minute. If you're continually putting yourself down, image the amount of self-bullying you are doing! Not convinced it makes a difference? The Navy SEALs swear by this technique, giving yourself positive feedback or positive self-talk. It's actually part of their 4 steps to success in becoming a Navy SEAL and seeing continued success. 5. Don't focus on the short-term. Remember that lollipop after the shot? If we only ever focused on the shot and not the enjoyable lollipop we get to eat after, then we'd probably have the flu every year. This is something that is studied time and time again, in order to see the success we want, we have to push based minor inconveniences that occur before we get there. Focus on the joy. Focus on what makes you happy in your business, but don't eat the easy marshmallow, work and wait to be able to eat two. What's better than one marshmallow? Two! Be able to eat those two marshmallows sooner by creating a website to cultivate your business through a website with integrated marketing tools - start today!